Red Angel or Red Herring — Was Star Trek: Discovery’s Reveal Worth the Wait? | TV Window.org - Red Angel or Red Herring -- Was Star Trek: Discovery's Reveal Worth the Wait? Red Angel or Red Herring — Was Star Trek: Discovery’s Reveal Worth the Wait? Well, I’ll admit I didn’t see that coming. I can appreciate being played. When it’s done well. And this was done pretty well, overall. I thought I had it figured out. It was obvious to me that Burnham had to be the Red Angel because every appearance either had to do with her safety (appearing to Spock as a child so he could tell Sarek where to find her) or she was present/involved. The exception, of course, was the Red Angel saving the Terralysium residents during World War 3, a detail the combined Discovery -Section 31 team conveniently ignored when formulating the mousetrap plan. There’s been a lot of Star Trek: Discovery in the news recently. Almost like they wanted to create some buzz just as the final batch of episodes landed, answering the driving questions of the season. First, there was the renewal announcement which is gratifying since this is definitely a Trek series going boldly where none have gone before. In addition, the promotion of Michelle Paradise to co-showrunner is an exciting development. Then came the news (?) that Captain Pike as played by Anson Mount would not be returning in Season 3. Don’t get me wrong, I’ve loved Pike. He’s been personable and responsible and an exemplary Starfleet captain in every respect. As a bonus, he’s got great comedic timing and his ability to adapt to some extreme (and, frankly, ridiculous) circumstances has been awesome. Pike: If you’re telling me that this ship can skip across the universe on a highway made of mushrooms, I kind of have to go on faith. But canon tells us that he’s the captain (however short-lived that turns out to be) of the U.S.S. Enterprise. His time on the Discovery was understood to be finite. Apparently, Discovery’s captains last about as long as Spinal Tap’s drummers. Thankfully, Saru was only Acting Captain at the end of Star Trek: Discovery Season 1 as they were en route to pick up their captain when the Enterprise appeared. As for Rebecca Romijn’s Number One, unless she makes a significant appearance in the final arc of the season, she’s only been on Star Trek: Discovery Season 2 Episode 4. Her departure doesn’t make much of a ripple for me. Related: Star Trek: Discovery Shocker — Who’s Out? Hot on the heels of these major (if not totally surprising) announcements about the future of Star Trek: Discovery, the show doubled down on their commitment to the time-traveling Littlest Hobo-style savior known so far only as the Red Angel. Compared to the Klingon conflict and Mirror Universe adventure of Star Trek: Discovery Season 1, this season has been both mystery and treasure hunt with its true antagonist masked behind the sinister aura of Section 31. To be fair, Section 31 hasn’t been forthcoming about ANYTHING (EVER). This is illustrated perfectly when they disclose that the Red Angel suit was technology they created themselves. Seriously? This led to Burnham confronting Leland about what he (still) wasn’t sharing about the Red Angel. And there was definitely something satisfying about her punching him out twice, once for each of the biological parents she lost due to his negligence. Georgiou’s presence on any mission is always to provide a variety of scenarios. Besides the highly-entertaining scene with Stamets, Culber, and Tilly in Engineering (“Did you just call me Buppy?” LOL), her involvement in the Red Angel reveal meant some intense scenes with Burnham. Those scenes may or may not have been influenced by her personal interest in taking out Leland. Spock, meanwhile, has been playing the snarky little brother card with relish. For much of Star Trek: Discovery Season 2 Episode 10, he could not let a scene go by without commenting on his sister’s penchant for useless guilt. My only issue with his role in the run-up to the reveal was that he didn’t recognize Burnham’s centrality to the Red Angel’s appearances himself. Related: Get CBS All Access via Prime Video Channels for Hit Shows, Exclusive Originals, and Live TV! Potentially, that’s the flaw the writers are trying to highlight in their relationship. Logic fails when it comes to family, especially for Spock. Buried in the shock of revealing the Red Angel’s identity, was a very rapid succession of events involving an unexplained echo of Leland’s authorization just before he’s taken out by the retinal scanner followed by his voice giving the order to capture the Red Angel. It can be assumed that Future Command has been pulling all the strings here, lying in wait in the Section 31 programming to remove the only threat to its sentience, Burnham and the Red Angel. In hindsight, the writers seeded the reveal’s potential beautifully. 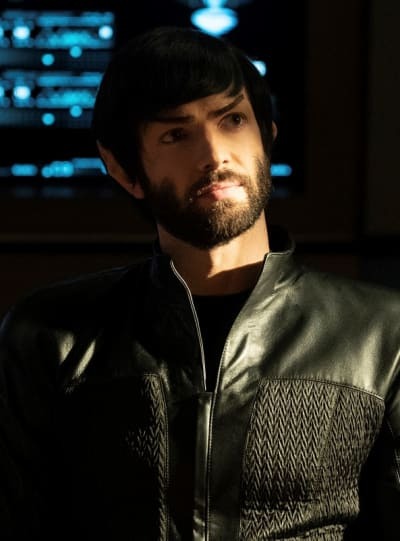 Having Spock pushing Burnham’s buttons about her parents’ death on Star Trek: Discovery Season 2 Episode 9 brought the previously barely-mentioned biological parents to our attention. It also shined a light on the guilt she felt about delaying their departure from Doctari Alpha to watch a star go supernova. Their involvement in Section 31’s time-travel project (as revealed by Leland) was a perfectly-timed link to the Red Angel storyline. (I have a multitude of issues with the mousetrap plan. Star Trek: Discovery does several things very. very well. When the mousetrap is sprung and the Red Angel Suit ejects its pilot at Burnham’s feet, I fully expected a throwback to Mirror Universe effects with Burnham facing herself. When it is clearly not Burnham on the ground, but instead Kima freakin’ Greggs from The Wire (Sonya Sohn) looks up and Burnham identifies her as MOM. Yeah, that was an awesome reveal. In case anyone’s keeping track, between Amanda adopting Burnham, MU Georgiou still harboring some maternal feelings, and now her biological astrophysicist/Red Angel mother showing up, Burnham got moms to spare. Mind you, this doesn’t conclude anything. Scary Future Command is clearly an active and dangerous threat and by capturing Mama Burnham, there’s a good chance the Discovery gang is facing some bleak odds moving forward. My inner geek has to point out that Star Trek: Discovery has been criticized for over-use of the deus ex machina solution trope in the past but with the Future Command antagonist, they are LITERALLY facing a “god from the machine” so I have to applaud them for owning it in an EPIC manner.